Here is Lowell Herrero's famous image of a cat at a dining table. The image is framed in two candle sticks. This is Lord Buffington. 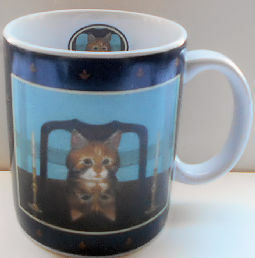 Notice the image of the cat's face is repeated on the inside of the mug. The ceramic mug is 3 3/4" high x 3 1/8" wide not including the handle. Copyright 1997. Previously owned but in good condition.